The most recent Times “Divert, Divert” example came in an overlong Times examination of what Pope Frances said in a Vatican private exchange with Palestinian President Mahmoud Abbas. Divert is the operative word through which Israel keeps the world from focusing either on positive Palestinian stories, or on Israel’s treatment of Palestinians under its military control. It does so with the dutiful assistance of publications like the New York Times. 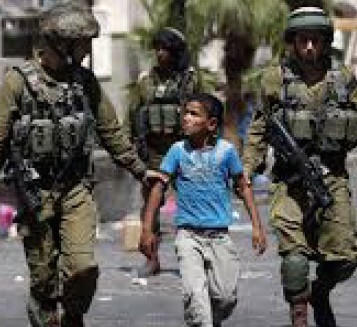 The picture above shows two Israeli soldiers arresting a Palestinian child in East Jerusalem. That photo is not from The New York Times. It is from a daily Arabic newspaper Alwatan, published in Oman. The most recent New York Times diversion story carries the ludicrously misleading headline: “Vatican Seeks to Quiet Uproar Over Pope’s ‘Angel of Peace’ Remark”. Did the pope tell Mr. Abbas “You are an angel of peace,” as many news outlets, including the main Italian news agency ANSA, The Associated Press and The New York Times, reported? That phrasing pleased Palestinians, but infuriated some Israelis and Jewish leaders around the world. Or was the pope encouraging Mr. Abbas with the words, “May you be an angel of peace,” as other major Italian news media, like La Repubblica and La Stampa, reported, a formulation that suggested more exhortation than commendation, and sounded better to pro-Israeli ears. It all seemed to boil down to the difference between the verb “sei,” Italian for “you are,” and “sia,” which means “may you be.” Pro-Israeli advocates were quick to pick up on the discrepancies, but Vatican officials did little to clarify the matter. Little done by the Vatican to clarify? Not true. In a statement issued by Vatican spokesman the Rev. Frederico Lombardi, the Times informs its readers, still pushing its Israeli narrative, that Father Lombardi engages in what the Times called ” some of his own diplomatic ambiguity”. The reader is expected to believe the following words from Father Lombardi are ambiguous? The Times dutifully reports that, according to The Vatican, “angels are, in fact, ‘messengers'”. Right, and in baseball, a double play is making two outs on the same play. Father Lombardi further informs the Times that the Vatican never reports on what the Pope says during private discussions, and that what is expressed during an exchange of gifts is not meant to be recorded. Oh, so now it is just a public spat. Well, that’s not the way Emmanuel Nahshon, the spokesman for the Israeli Foreign Ministry, sees it. A private conversation between the Pope and a guest was recorded and now is in the hands of the Israeli Foreign Ministry. Does this mean the Vatican is bugged? As the story grinds to an end, we finally receive a word from someone who knows how to interpret this story of a “spat” for what it really is, a typical pro-Israel diversion from the more important and positive reports about the Vatican and Palestine. Hanan Ashrawi, a member of the Palestine Liberation Organization’s executive committee, laughed when asked about the controversy, saying she was not about to provide “a biblical exegesis on ‘may you be’ or ‘you are’. Ms. Ashrawi was not at the meeting in the Vatican and said she had not bothered to call and ask exactly what words were spoken to Mr. Abbas. She pointed to the wider context of Mr. Abbas’s visit, including the recognition issue and the canonization of two 19th-century nuns. For a more complete take on the canonization story, click here. This story adds a detail left out of the Times account, answering the question of why President Abbas was in Rome in the first place. Wham, bam, two big stories: Canonization of two Palestinian women, side by side with Palestinian statehood recognition by the Vatican. That is the big news out of the Vatican. By welcome, we must presume Mr. Foxman means, the Times report on the Vatican’s linguistic clarification? Less welcome to Mr. Foxman, we may also presume, are the facts that Pope Francis has presented President Abbas with “a bronze medal that represents an angel of peace”, canonized two Palestinian nuns, and recognized Palestine as a state. A closing reminder to American Protestant church leaders who will meet in a variety of venues this summer to continue their debates on how best to relate to their Jewish neighbors (Jewish neighbors, not Israeli neighbors). The words above are written on one of the many walls Israel built to keep Palestinians within their own homeland. In their deliberations, these church leaders will need to remember that, as the wall proclaims, “Criticism of Israel is Not Anti-Semitic”. They also need to remember that Israel is a nation that believes it must divert rather than face the reality of its conduct. The picture at top was taken in East Jerusalem. It appeared in Alwatan, a daily Arabic newspaper published in Oman and distributed internationally. 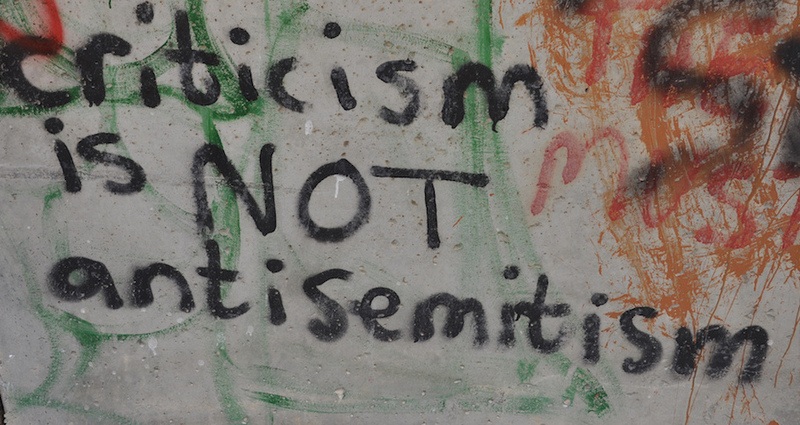 The words witten on a Palestinian wall is a Neil Flickr photo from Mondoweiss. The Vatican recognizes the State of Palestine and the canonization of the two Palestinian nuns. The task of the Israeli and Zionist “Masters of Deceit” is to always eliminate, suffocate, or create “controversy” over any positive recognition to do with Palestine, the credibility of Palestine, the legitimization of Palestine, the trust in Palestinian leadership, Palestinian resistance against tyrannical occupation, and much more. The “Masters of Deceit” also try to fog-up the media environment, whenever Israel is involved in crimes, massacres, genocide, invasions, and ethnic cleansing, or other negative stories to do with Israel’s acquisition of nuclear weapons, spying on the Vatican, the US, EU, and other countries permeated with servitude of their Israeli masters. Israel should realize that its continued deceptive, tyrannical de-legitimizing of Palestine and its efforts to submerge Palestine will only lead to the justification of de-legitimizing of Israel, itself. Thanks Jim for this great article which refers to two great events that took place at the Vatican recently, mainly the recognition of Palestine and the canonization of two Palestinian women. But what I want to thank you mostly for is the focus on the “Divert” policy which Israel has been using for a long time to pull wool on the eyes of the whole world. Thanks, Jim and Thanks,Awad. You expressed my thoughts so perfectly. Shame on those who allow themselves to be “deceived” despite possessing brilliant minds. Jim, Your comments are worthy of a Daily Show episode. I nominate you to succeed Jon Stewart! This would be really funny if it weren’t so sad. Wonderful article! Your great journalism on the lack thereof in the NYT and their subservience to a foreign state ought itself to be the NYT headline! The NYT has a long history of divert/diversion…and it is “supposed” to be one of our better newspapers! Well, I prefer James Wall and going to Palestine myself for stories of the Truth. Do you remember the exchange with the Foreign Ministry officer when we asked about the Israeli support of the Christian Zionist support of Israel? They support Israel so that the Messiah can come again and all unrepentant Jews will burn in Hell. He said “politics make strange bedfellows,” indicating that duplicity was state policy! The NYT did very little truthful reporting of the last two “mowing of the lawn” in Gaza and I don’t think they have ever reported the IDF desecration of Christian schools in Palestine or their interference with the movements of Church hierarchy within Israel. So much for “all the news that’s fit to print”! !